A few references discussing why Krishna is called "Krishna." A selection of Srila Prabhupada's commentaries and conversations about the name "Krishna," including its Sanskrit etymology (word origin). Where possible, we've provided links for further exploring the topic or obtaining your own copy of the book quoted. "The name Krishna means 'all-attractive.' God attracts everyone; that is the definition of 'God.' We have seen many pictures of Krishna, and we see that He attracts the cows, calves, birds, beasts, trees, plants, and even the water in Vrindavana. He is attractive to the cowherd boys, to the gopis, to Nanda Maharaja, to the Pandavas, and to all human society. Therefore if any particular name can be given to God, that name is 'Krishna.'" Srila Prabhupada: Yes. God has no name, but by His qualities we give Him names. If a man is very beautiful, we call him 'beautiful.' If a man is very intelligent, we call him 'wise.' So the name is given according to the quality. Because God is all-attractive, the name Krishna can be applied only to Him. 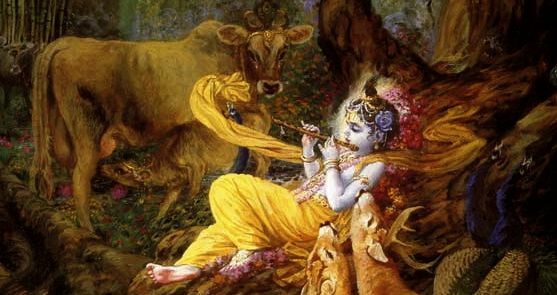 Krishna means 'all-attractive.' It includes everything.